To log in enter your account’s email and password. If you don’t have the account, contact the Hydra OMS administrator. 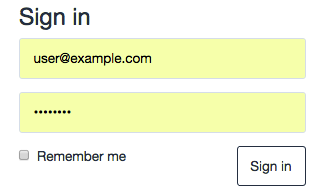 Check the box Remember me to save your account information. 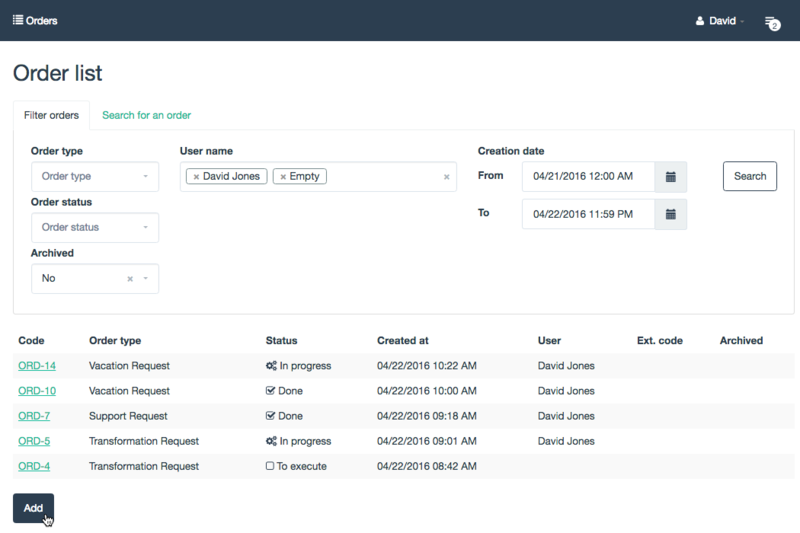 On the left of the main menu you can see tools for orders processing (Orders), the settings for the order types (Order types) and Hydra OMS users management tools (Users). Order Types and Users sections are available only for system administrators. Current user name and button that opens the user tasks panel are located on the right. By clicking on the user name you can view Help or sign out. All orders are stored in the Orders list, which opens from Orders menu. There are Filter Orders tab and Search tab for searching. time period when the order was created. Archived field allows you to select only archived or non-archived orders. 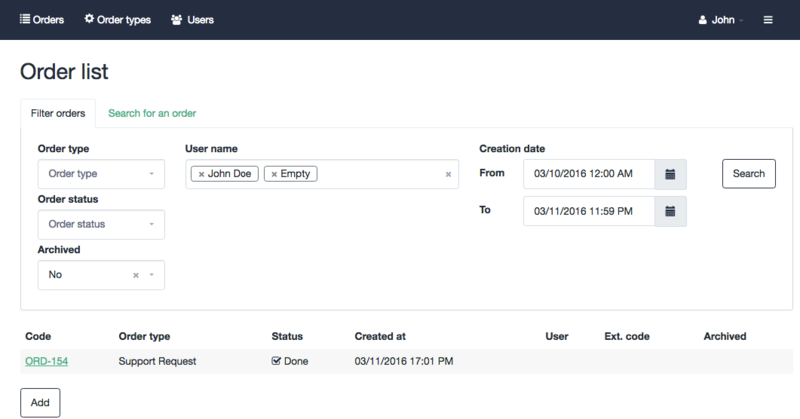 On the Search for an order tab you can find certain orders by the internal (in Hydra OMS) or external code (this order field is intended for integration with external systems). 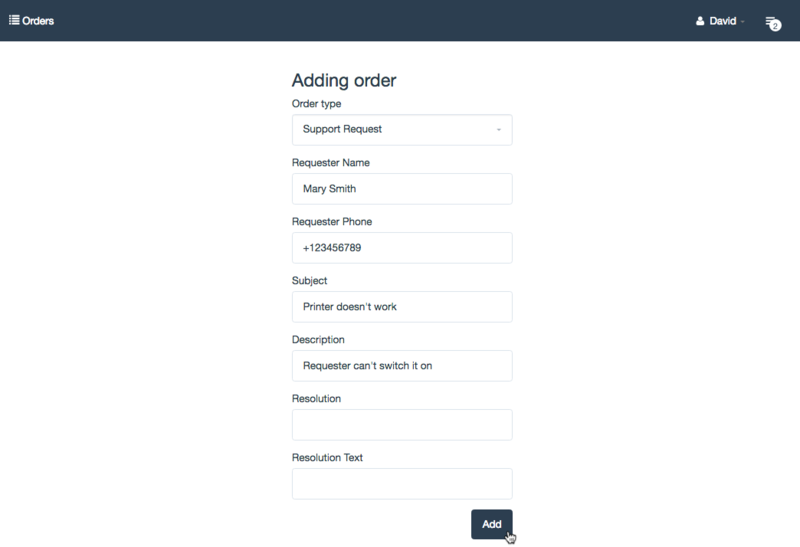 Select the order type, fill in all the information required and click the Add button. The order is created. 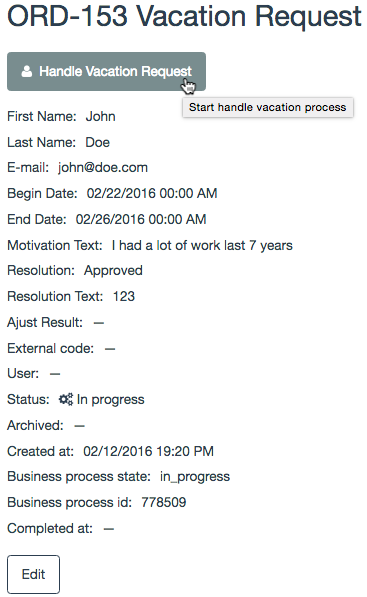 Click on the code of the order in the orders list to to view or edit it. 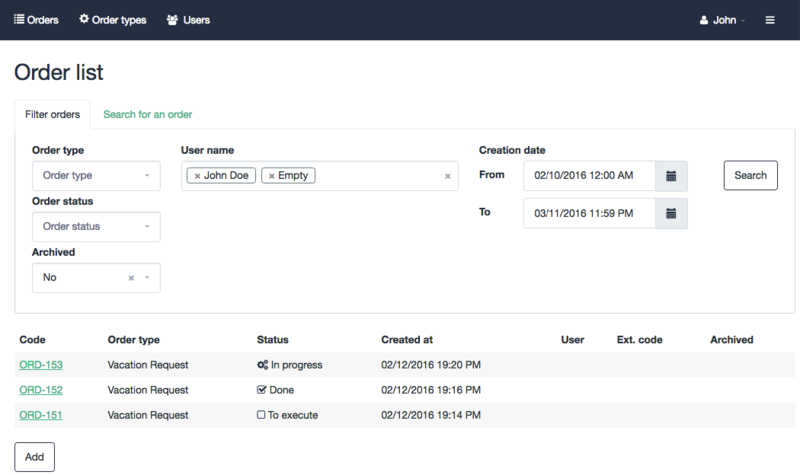 Order form includes the header (code and the order type), the BPM widget and the set of fields stored in the Hydra OMS database. 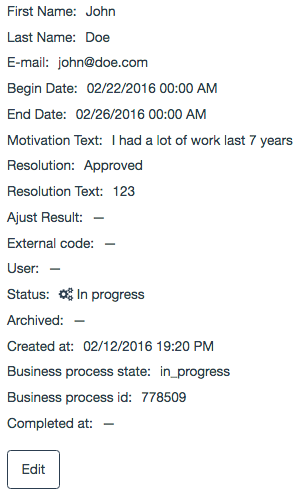 BPM widget buttons initiate appropriate business processes. 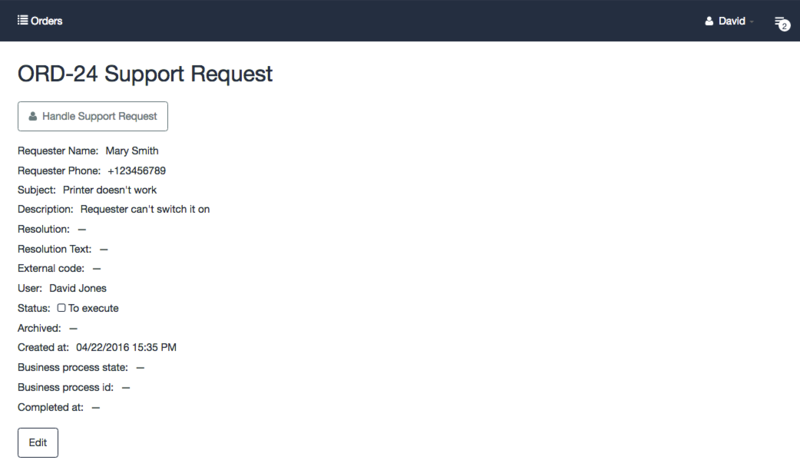 If there are no buttons displayed, the order is already being handled by one of the business process or there are no business processes assigned. For example, click the Handle Vacation Request button to process the order with the code ORD-153 and Vacation Request type. 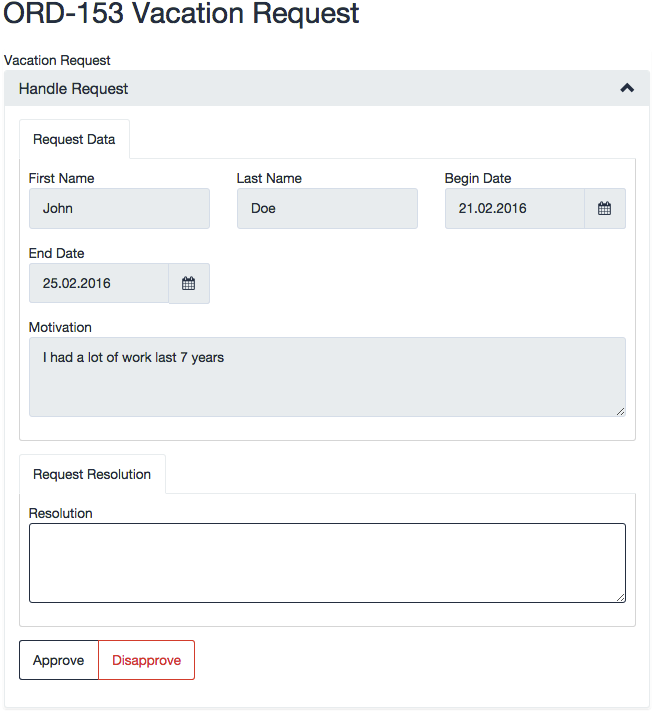 Required information will be displayed in the widget together with available actions (Approve and Disapprove) for the first user task of the business process. 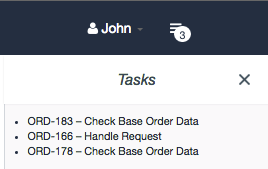 The order fields stored in the Hydra OMS database are displayed below the BPM widget. These fields are filled by the BPM system via the API (documentation for the Hydra OMS API can be found here http://hydra-oms.com/api/). The rest of the fields are user fields and can be adjusted for a certain order type. The values within them are managed by the BPM system in accordance with the changes within business processes. They can be edited if the order type configuration allows it. To edit, click the Edit button. The button opens the panel for user’s current tasks. The number of the tasks is displayed on the button. Click the task to view or edit the corresponding order.